Graphene has been hailed as a wonder material since it was first isolated from graphite in 2004. Graphene is just a single atom thick but it is flexible, stronger than steel, and capable of efficiently conducting heat and electricity. However, widespread industrial adoption of graphene has so far been limited by the expense of producing it. Affordable graphene production could lead to a wide range of new technologies reaching the market, including synthetic skin capable of providing sensory feedback to people with limb prostheses. Researchers at the University of Glasgow have now found a way to produce large sheets of graphene using the same cheap type of copper used to manufacture lithium-ion batteries found in many household devices. In a new paper published today in the journal Scientific Reports, a team led by Dr Ravinder Dahiya explain how they have been able to produce large-area graphene around 100 times cheaper than ever before. Dr Dahiya, of the University of Glasgow's School of Engineering, said: "The commercially-available copper we used in our process retails for around one dollar per square metre, compared to around $115 for a similar amount of the copper currently used in graphene production. This more expensive form of copper often required preparation before it can be used, adding further to the cost of the process. "Our process produces high-quality graphene at low cost, taking us one step closer to creating affordable new electronic devices with a wide range of applications, from the smart cities of the future to mobile healthcare. "Much of my own research is in the field of synthetic skin. 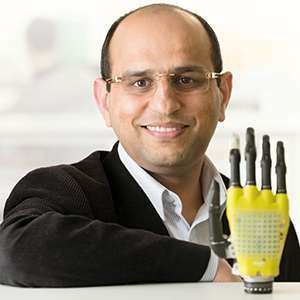 Graphene could help provide an ultraflexible, conductive surface which could provide people with prosthetics capable of providing sensation in a way that is impossible for even the most advanced prosthetics today. "It's a very exciting discovery and we're keen to continue our research." The team's paper, titled 'Synthesis of Large Area Graphene for High Performance in Flexible Optoelectronic Devices', is published in Scientific Reports. This is huge if it works out and can scale up. There is an incredible amount of technology currently blocked by the production cost and availability of large area graphene. Nice. The article linked at the bottom is well worth the read. Thanks, AA - the article is excellent!